I'd been thinking of taking advantage of the forecast brief weather window to ski on the last day of summer, but hadn't really made any plans as of late evening the night before. A phone call from Cyril changed that, he was visiting Seattle from Oregon and really wanted to ski the new September snow. So we decided to head for Muir on Tuesday. Clouds obscured the mountain as we drove south after a leisurely morning start, and we endured a lengthy 25 minute delay due to construction between Longmire and Paradise. But as expected, the skies cleared as we reached the parking lot and it was really beautiful, cool and crisp and sunny. The mountain and glaciers looked glorious with the thick coating of new snow as we set off around 10:30am. The few inches of recent snow at Paradise had already melted, but snow patches appeared above 6000 ft and the trail became fully snowcovered by 6800 ft near Pan Point. We put the skis on at Pebble Creek and skinned the rest of the way to Camp Muir by 2:30pm. The recent snow underfoot had begun its transformation to mush and glop, sticking tenaciously to our skins despite liberal applications of skin wax. Above 9000 ft, large areas of snow had already developed firnspiegel in the sunshine and were nearly done transforming to corn. The ski descent was fun, the snow was good but not great, several inches of carveable "Cascade powder" or near-corn on a firm base. The Muir Snowfield is certainly not "utterly and completely tracked out", it was easy to find vast areas of untracked snow, especially on the western third of the snowfield above 9000 ft which had no tracks at all (and where no sensible person should have gone in Sunday or Monday's bad visibility). I knew snow conditions would have been better on Sunday, but the clear skies and spectacular views on Tuesday were ample compensation. Air clarity was probably the best it has been in several months, Mount Adams and Goat Rocks were sharp and well-defined with their new snowcover. 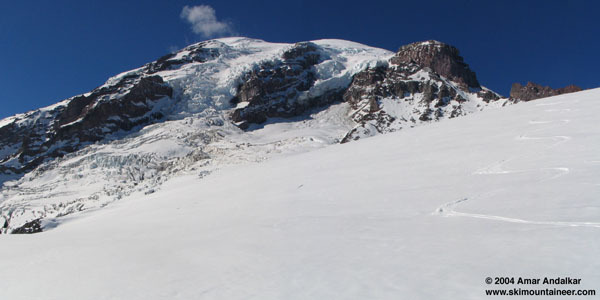 The Nisqually Glacier looked outrageous with its crevasses outlined and highlighted by the new snow, and the Nisqually Ice Cliff unleashed several sizeable ice avalanches during the day. We skied all the way down to Pebble Creek on continuous deep snowcover, and then weaved and traversed through the rocks and along the snow-filled trail down to 7000 ft. The only other skiers/snowboarders we saw all day were a couple still climbing up near 7500 ft at 4pm, now that's getting a late start. Occasional clouds and fog finally rose out of the valley to greet us, the only blemishes on an otherwise ideal weather day. Even enduring another lengthy construction delay (nearly half-hour) on the drive back couldn't put a damper on such a glorious day, a perfect way to end the summer. By the way, despite Wednesday's light rain, it seems likely that sunny weather on Thursday-Friday should produce nice corn snow over the entire snowfield in time for the upcoming weekend. My carves alone grace the untracked expanses along the western edge of the Muir Snowfield (Cyril's tracks are barely visible in the distance). Click here for an enlarged version of this photo. I'm not sure if this would work for everyone, but taking 410 through Enumclaw/Stevens Canyon Road to Paradise from the Eastside seemed as fast, if not faster than Eatonville/Elbe when I did it last Friday. No Puyallup/Graham crawl! Streets and Trips computes the 410 / Stevens Canyon route as a 110 mile 3 hour drive from the I-90 / I-405 interchange. The South Hill route computes to 105 miles -- but 2 1/2 hours -- but this figure doesn't really take congestion into account.. The 410 / Steven's canyon route is certainly prettier. An extra 1/2 hour for five miles? Mileage sounds right, and you're dead on about the scenery.